“We only have one room left,” he said, “but it’s on the adult only floor, so no kids allowed.” As I glanced down at my ever-expanding belly I thought, “what the heck. This would be our last chance to stay on an adult only floor for a very long time; our last hurrah.” “We’ll take it,” I replied. We were on our way to Edmonton for a little Easter weekend getaway; our last trip as a childless couple. He was born that August and then before I knew it, he was done with baby food and onto solids. And I had all this leftover baby food. What to do with it? Well, make Carrot Cake Overnight French Toast Casserole, that’s what! Wow and I thought the baby food stage went fast…. BK was “before kids” and AK meant “after kids.” Not only was it funny, it was so true! Having kids is life altering after all… They tell you to enjoy the peace and quiet, your sleep and freedom “BK” because “AK”, it will be gone. But I guess you can’t truly miss something until it is really gone. I had already been an adult for years, yet I didn’t even know these adult only hotel floors existed! Why didn’t I know about these floors when I really needed them? When the team of 10-year-old hockey players were pounding the hallways above me, while I spent the night staring at the ceiling? And now, with a baby on the way, I’d no longer be welcome there. But that night on the adult only floor of that hotel, I still didn’t appreciate the sleep, the peace, quiet, freedom, lack of responsibility. I didn’t appreciate any of it. How could I? I didn’t know any different. My daughter came into the world a short 22 months later. They rocked my world in every way possible. And yes, BK seemed like another lifetime ago. I could clearly see the division. My babies may be gone, but the leftover baby food recipes survived. Because fortunately and surprisingly, baby food isn’t just for babies! The beauty of baby food is that the work is already done for you! Why do all that shredding or cooking and puréeing carrots when you don’t have to? That’s why I use carrots, in the form of baby food, in this casserole; it’s super quick and easy! And since they make it for babies, there are no preservatives and fillers in it. It’s pure carrots and water. And the brand I uses makes theirs with organic carrots. Plus, you can buy baby food anywhere! Overnight French toast Casseroles are so much easier than fussing with making individual french toast. It takes about 10 minutes to throw together the night before, you let it rest overnight in the fridge while you slumber and the next morning, you pop it in the oven. Easy Peasy! And perfect for your Easter brunch. Easter starts with eggs and so does this Baked French Toast Casserole! 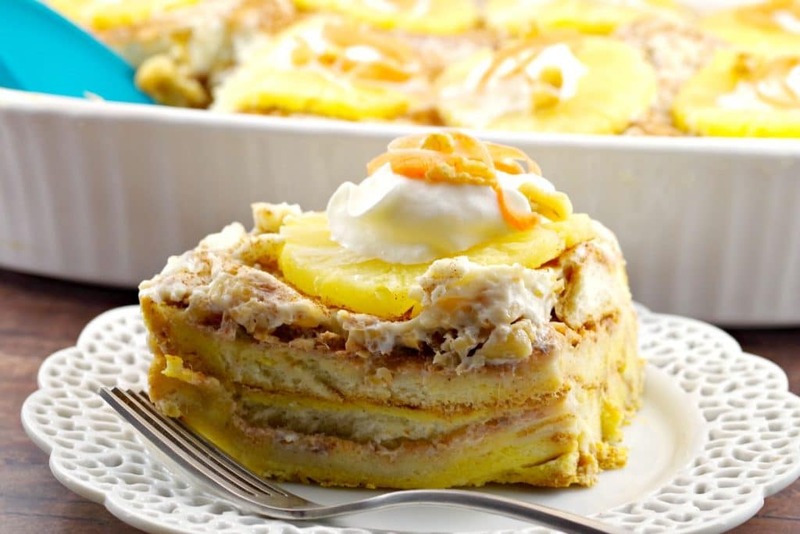 This french toast casserole not only boasts healthy carrots (baby food) and other real, wholesome ingredients like cinnamon, pineapple, walnuts and cream, it has lots of healthy eggs! Yet it still tastes like you’re eating a carrot cake for breakfast! It’s amazing to see how versatile eggs can be; you often don’t even realize they’re the ‘hidden glue’ or backbone of so many recipes. So, if you want to have dessert for breakfast and still feel good about it, then make this Carrot Cake French Toast Casserole with cream cheese glaze. Perfect for breakfast, lunch and dinner, and essential for Easter desserts (or in this case ‘dessert for breakfast’! ), Canadian eggs are delicious and nutritious. When you enjoy Canada Grade A eggs, you know you’re getting a top-quality product made by Canadians, for all Canadians. No matter where you purchase your eggs, they are from a Canadian farmer. On average, eggs travel from the farm to grocery store in less than a week! My family loves this recipe and requests it every year for Easter brunch! And thanks to the system of supply management, over 1,000 other Canadian family farms work year-round from coast to coast to provide us all with the fresh, local, high- quality eggs for you and your family love and enjoy. It’s been 14 years since that Easter trip to Edmonton. And as we prepare for this year’s Easter trip to Edmonton, we definitely won’t be booking a room on an adult only floor. These days the hotel we stay at HAS to have a pool and be as close as possible to the water park (even though I don’t even like swimming.) But I wouldn’t trade it for the world. Nor would I trade it for all the peace and quiet of any adult only floor. Although being a parent is wrought with sleepless nights, lack of peace and quiet and the loss of many freedoms, I’d take AK over BK any day because you don’t know what you’re missing until you have it. So, as the years fly by and the babies they were become but a distant memory, the baby food recipes live on. And as a mother, they allow me to hang on to just a wee bit of that baby time because unbeknownst to them, at almost 14 and 12, I still get to feed them baby food! Eggs are synonymous with Easter so it’s the perfect time to celebrate Canadian eggs by sharing your favourite egg dishes with family and friends. 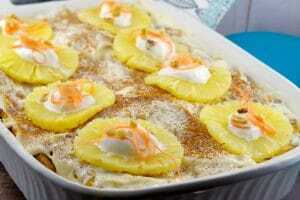 Give this Sunny Side Up Pavlova Recipe a try too! And why not mix it up with a choose-your-own Pavlova topping station at your celebration? But eggs aren’t just for Easter (and neither is carrot cake) –obviously! You can eat them every day. And for all my Weight Watchers friends, remember eggs are 0 points! Yes, that’s ZERO freestyle smart points!!! So, if you’re looking for even more great egg recipes and nutrition information, click HERE and you can follow @eggsoeufs on Twitter. Instagram and Get Cracking on Facebook! How will YOU be enjoying your eggs for Easter? Generously spray a 9 X 13 casserole dish or baking dish with non- stick cooking spray. 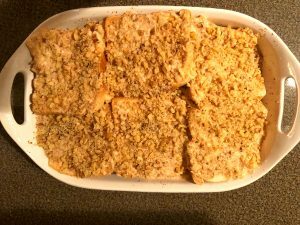 Arrange 1/2 the loaf of slices of bread in 2 rows, overlapping if need be, in a casserole dish. In a large bowl, combine the eggs, half-and-half cream, drained, crushed and squeezed pineapple (make sure you squeeze as much liquid out as possible! ), pureed carrots (baby food), brown sugar, white granulated sugar, vanilla, cinnamon and maple syrup. Then beat with a whisk until blended thoroughly. Pour 1/2 the liquid mixture over the bread slices, making sure all are covered evenly with the cream-egg mixture. Sprinkle finely chopped walnut evenly over soaked bread slices. Remove foil and return to oven for an additional 15 minutes. Meanwhile prepare glaze. Beat softened cream cheese with a hand mixer until smooth. Gradually add powdered sugar/icing sugar until incorporated. Then add milk and vanilla. Spread glaze over warm casserole with a spatula. 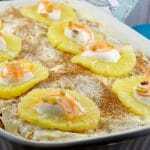 Pat the pineapple rings dry with paper towel and place on top of casserole, as shown. Use a vegetable peeler to make thin ribbons with carrots, then add 2-3 on top of whipped cream. Add few pieces of chopped walnuts. Serve with additional syrup and whipped cream, as desired. This can also be reheated and served later. If you are taking it along to a gathering or potluck make sure you bake it in a microwaveable casserole dish (so it can warmed up)! And be sure to bring along additional maple syrup and whipped cream to serve with it! You can freeze leftovers! I froze my leftovers of this recipe, fully garnished, then heated up a piece for 1 minute and 30 seconds. The texture was a little more moist so I wouldn't recommend this for serving initially, but it's fine for leftovers. Well how brilliant is that?! I would have never thought to use baby food carrots. As a vegetarian I have a love affair with eggs so a fabulous recipe to add to my collection. Being able to make it the night before takes the stress away and a special morning to share with friends. I love the fact that is is an overnight recipe. Easter is so busy for us between families that I usually do a brunch for my family so am always looking for a good recipe like this that just needs to be popped in the oven in the morning! I hear you, Alisa! I am not the greatest at hosting (I get stressed) so the more I can do in advance, the better! Hi Dawn – thanks! Yes, it is definitely a random any day recipe! This is brilliant. I never, ever would have thought to use baby food in any recipe, but wow this looks delicious and simple. I Can’t wit to try it!! This looks so delicious. Thanks for sharing such a wonderful recipe. I love the terms BK and AK, Terri. I think so many of us Moms can relate to that, for sure! 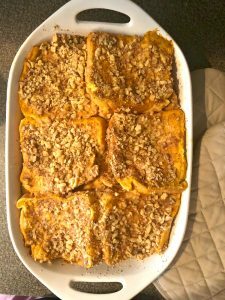 Your overnight french toast carrot cake casserole sounds wonderful! And what a great tip to use that perfect carrot baby food puree. It’s brilliant! Thanks for sharing. Oh my gosh! So perfect for Easter brunch. My guests are going to love it. Thank you for sharing, I can’t wait to give it a go! Hey!! this looks delish! Can’t wait to make this for the little one.